The hottest name in the UFC’s middleweight division belongs to Chris Weidman. Fresh off a beat down of leading middleweight contender Mark Munoz, it was just announced this week that he will next fight Tim Boetsch on December 29th for the right to face Anderson “The Spider” Silva with the belt on the line. His ascension to legitimate middleweight contender has been quick thanks to his willingness to fight (five fights in a year and a half) and a commitment to discipline, including a 32 pound weight loss in 11 days prior to fighting Damian Maia. “I had to cut 32 pounds in 10 days on top of not being in great shape. I pretty much came right off the couch and took that fight. It definitely wasn’t a great idea for me and was probably the worst experience I ever had. So, I wouldn’t recommend anyone else doing that and I would never do it again myself. What has created so much buzz about Weidman is his overall multifaceted skill set, and his ability to finish fights in different ways. In the course of going undefeated in his first five UFC fights, Weidman has collected both “Submission of the Night” and “Knockout of the Night” honors, an incredibly rare feat. 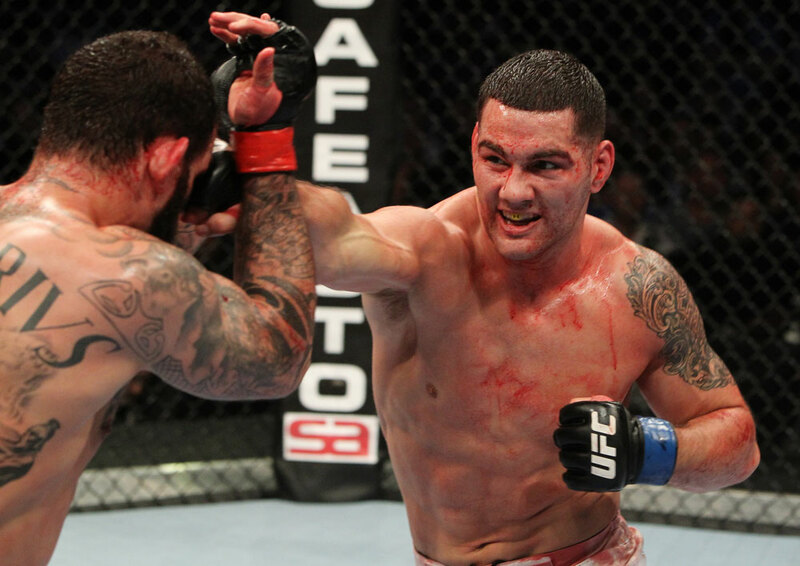 “I don’t really have a preferred way to end a fight, I just want to end it and win, “said Weidman. “It’s always a good feeling to knock someone out, but I don’t want to be one of those guys who only looks for knockouts and get caught because that’s what I’m looking for exclusively. These days, Weidman’s name has been increasingly linked with middleweight champ Anderson Silva. Thanks to the way Silva has torn through every one the UFC has put in front of him, and the quick rise and exciting fights Weidman has fast become known for, it’s a fight the fans want to see. But Silva’s camp has been reluctant to accept. “It’s frustrating,” said Weidman about trying to orchestrate a fight for the title. “Since I got into the sport anytime I’d tell people I was doing MMA they’d ask what weight class and I’d say middle weight and they’d say “Isn’t that Anderson Silva’s weight class? Oh, you’re screwed. You better change weight classes, pal.” That motivated me and he deserves that type of respect ‘cause he’s earned it, but it motivated me to take risks like fighting on short notice and I’ve worked really hard to be the #1 contender and for him to just kind of downplay me, more his managers, it’s kind of frustrating. So I hope the UFC makes the fight happens but if not, I will fight someone else. Previous articleGilbert Arenas’ House For Sale; Would You Rather Be Him Or Vanilla Ice?